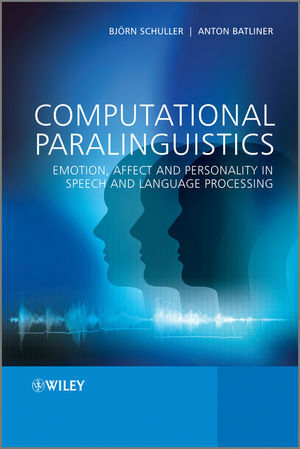 This book presents the methods, tools and techniques that are currently being used to recognise (automatically) the affect, emotion, personality and everything else beyond linguistics (‘paralinguistics’) expressed by or embedded in human speech and language. It is the first book to provide such a systematic survey of paralinguistics in speech and language processing. The technology described has evolved mainly from automatic speech and speaker recognition and processing, but also takes into account recent developments within speech signal processing, machine intelligence and data mining. Moreover, the book offers a hands-on approach by integrating actual data sets, software, and open-source utilities which will make the book invaluable as a teaching tool and similarly useful for those professionals already in the field. Provides an integrated presentation of basic research (in phonetics/linguistics and humanities) with state-of-the-art engineering approaches for speech signal processing and machine intelligence. Explains the history and state of the art of all of the sub-fields which contribute to the topic of computational paralinguistics. C overs the signal processing and machine learning aspects of the actual computational modelling of emotion and personality and explains the detection process from corpus collection to feature extraction and from model testing to system integration. Details aspects of real-world system integration including distribution, weakly supervised learning and confidence measures. Outlines machine learning approaches including static, dynamic and context‑sensitive algorithms for classification and regression. Includes a tutorial on freely available toolkits, such as the open-source ‘openEAR’ toolkit for emotion and affect recognition co-developed by one of the authors, and a listing of standard databases and feature sets used in the field to allow for immediate experimentation enabling the reader to build an emotion detection model on an existing corpus.